What a difference a year can make. 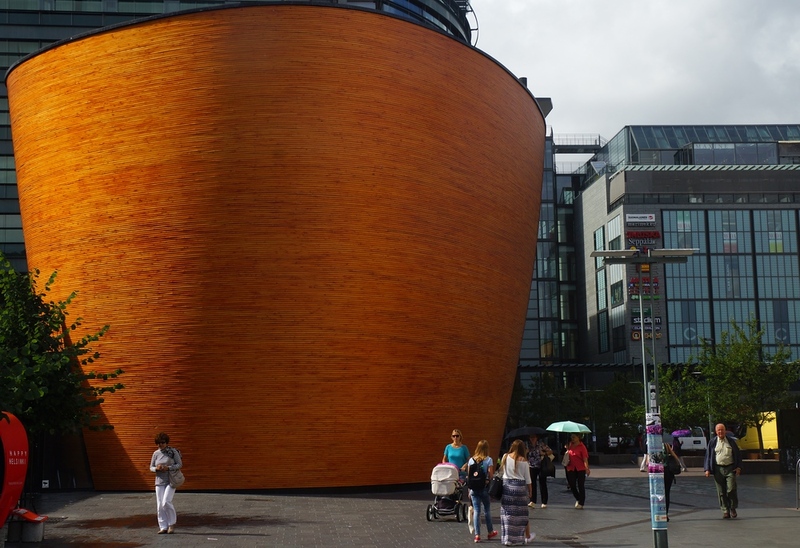 When we first visited Helsinki one summer ago, we only had a few days to explore the capital city of Finland. Unfortunately, the weather was overcast and drab and it was as though we were walking through a ghost town coming from ever chaotic Bangkok, Thailand. Fortunately, on our most recent trip this summer we had more time to explore the city and the weather was far more cooperative. With summer in full swing, we enjoyed dinners al fresco, boat trips to nearby islands, and lots of walking around town. What amazed us was the plethora of outdoor adventure opportunities that exist mere kilometers away from the downtown core. Within minutes you can escape the masses and have your own little slice of nature while on your bicycle or kayak. 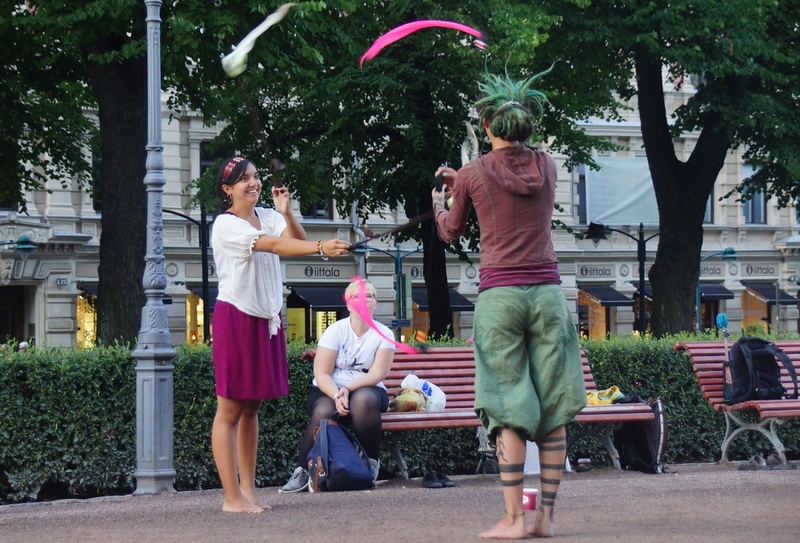 One of our favorite things about being in Helsinki were all the street performances taking place. Esplanade Park hosted several concerts, which were free to the public and we made the most of our lazy afternoons checking them out. There is no better spot in Helsinki for people watching. 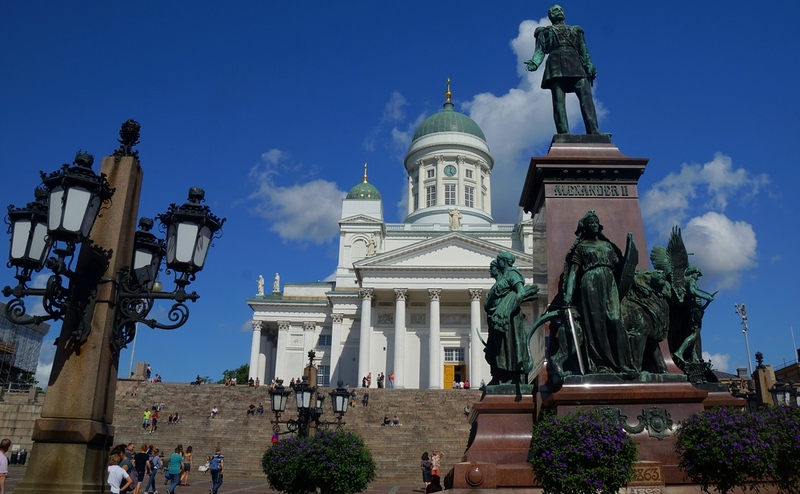 One of the most famous landmarks in all of Helsinki is Helsinki Cathedral. What is really cool about this church is that it is very different from other churches across Europe. Most European churches are very elaborate and are dotted with paintings inside; however, once we got inside this church we noticed simple, white and minimalist designs reminiscent of a blank canvas. Helsinki Cathedral overlooks Senate Square, so after you visit the church, you can sit down on the steps and watch people go by. 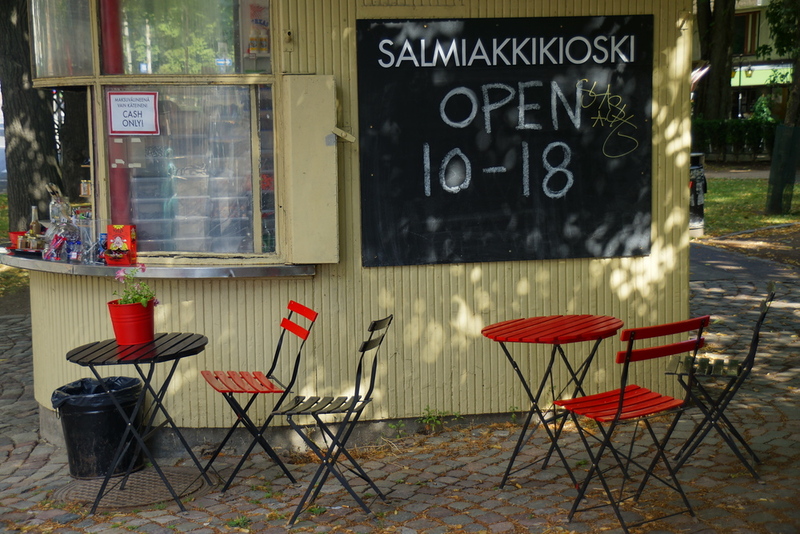 My idea of heaven on earth includes a Salmiakki kiosk nearby. As an enormous Salmiakki fan, a kind of astringent salty black licorice popular in Nordic countries, I could hardly contain myself when faced with Salmiakki options galore at this particular kiosk, which apparently sells over 91 types of Salmiakki products. I finally settled on Salmiakki ice cream which came in the diamond shape. It was was creamy and sweet with an overpowering Salmiakki flavor. If you’re looking for something else to try, I’ve been told by locals that Salmiakki coffee is top notch from this kiosk. Market square is a great place to pick up fresh vegetables and berries, and you can also try a number of traditional Finnish dishes ranging from grilled salmon to reindeer meatballs. We frequented the market almost daily, and at 10 Euros a meal, we thought it was a budget-friendly option for travellers. 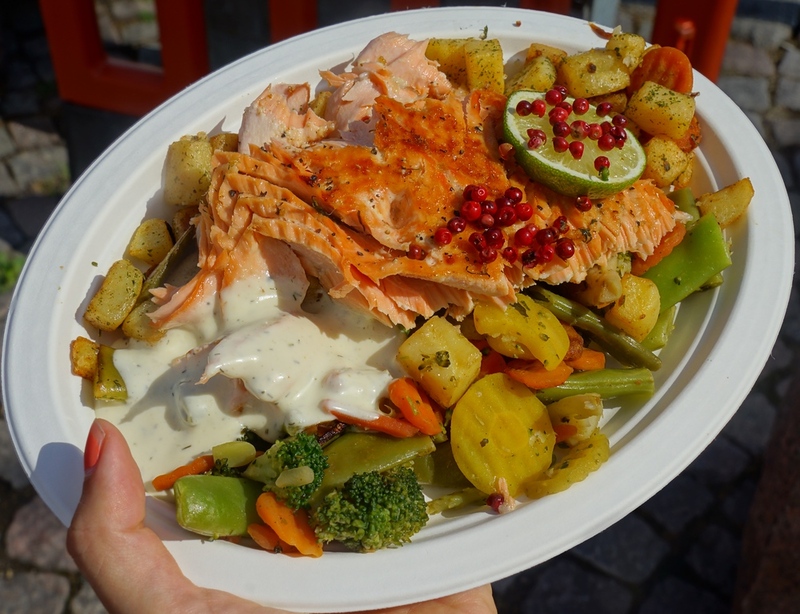 What you’ll notice in the photo above is Finnish grilled salmon, potatoes and vegetables. We found that sharing a plate was a very satisfying lunch. Helsinki has a thriving design district and Audrey especially enjoyed visiting various shops which showcased the best of Scandinavian design. If your time is limited and you can’t explore them all, then check out Marimekko which is renowned for its bold patterns and bright colours. Finland has a unique tradition where people come and wash their carpets on floating docks by the sea. The carpets are then left to dry overnight without fear of anyone stealing them. Bars have popped up by some of the docks, so after washing your carpets you can relax with a drink in hand. 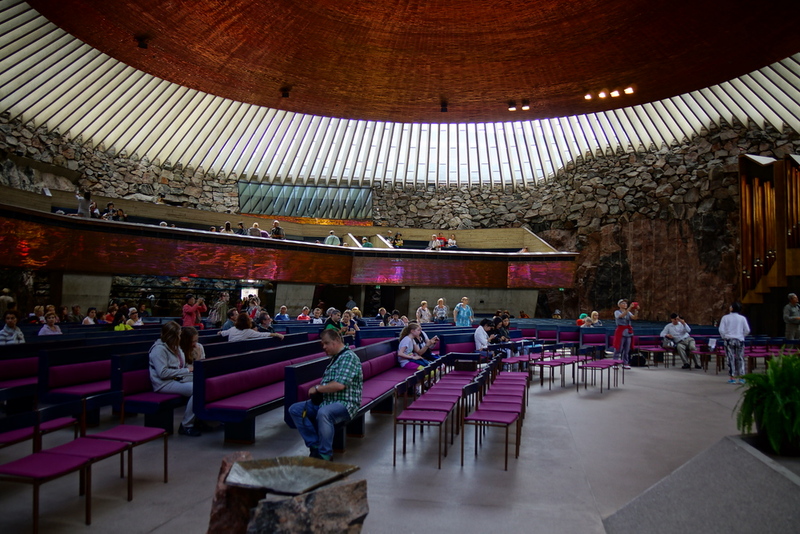 The Kamppi Chapel of Silence is located in one of the busiest areas of Helsinki and is a place where anyone can drop by and just enjoy a moment of silence. No services are held in this church but they do have clergy and social workers on hand if anyone needs a little support. 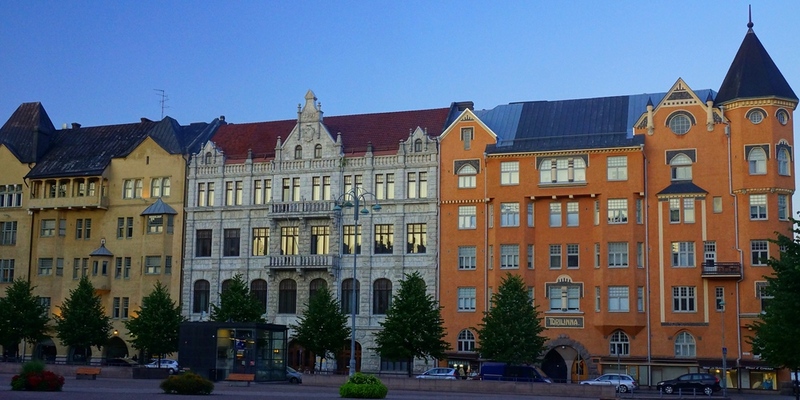 Helsinki has a number of unique landmarks and attractions. One of them being this church carved out of a rock. Featuring world class acoustics it is actually a very popular concert hall. The roof consists of a copper dome surrounded by a skylight, which allows natural light to stream into the building. 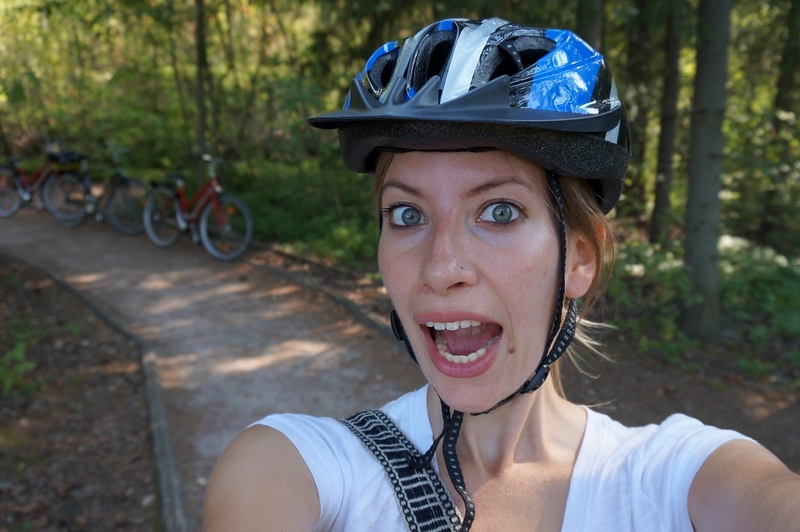 Easily one of my favorite activities in Helsinki was taking a bicycle tour. We started off by exploring the downtown area but it wasn’t soon before we escaped all the hustle and bustle immersing ourselves in nature. I’ve never visited a city before where it was so easy to just get away from it all. 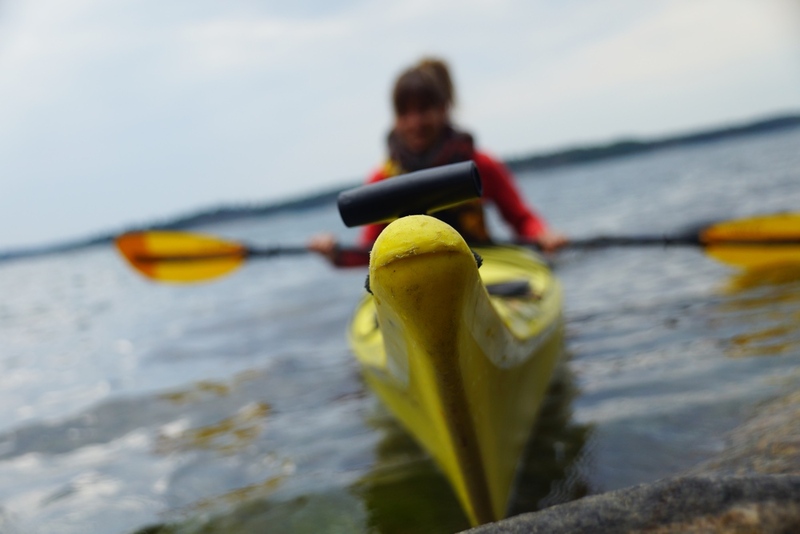 Kayaking is one of the most popular outdoors adventure activities in Finland and you can do it in Helsinki. On our midnight guided tour we paddled back home in the dark with nothing but the moon and our headlamps to guide us. During one of our afternoons in Helsinki, we hopped aboard the Helsinki Sightseeing cruise. The trip was an hour and a half in length, and we got to see the various islands that make up the city’s archipelago. It was a beautiful sunny day with blue skies, and we saw a lot of sailboats out on the water. 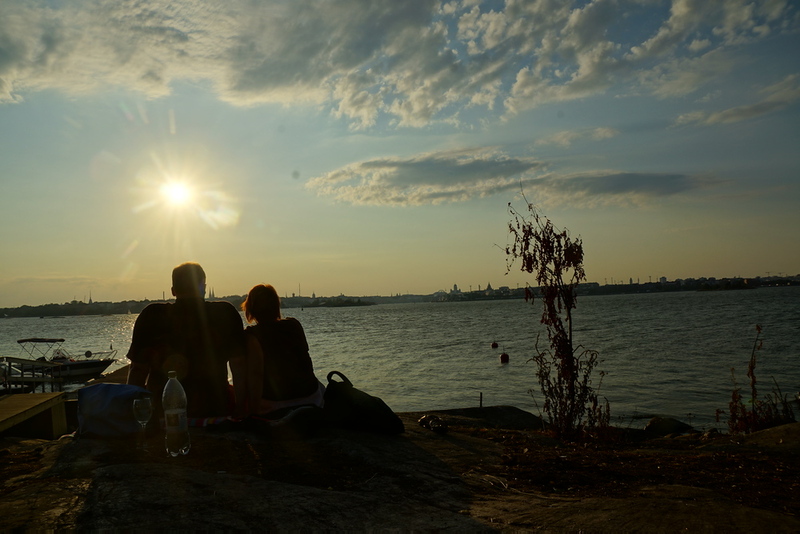 A couple enjoying a picnic and a bottle of wine while waiting for sunset on the recently opened Lonna Island in Helsinki, Finland. 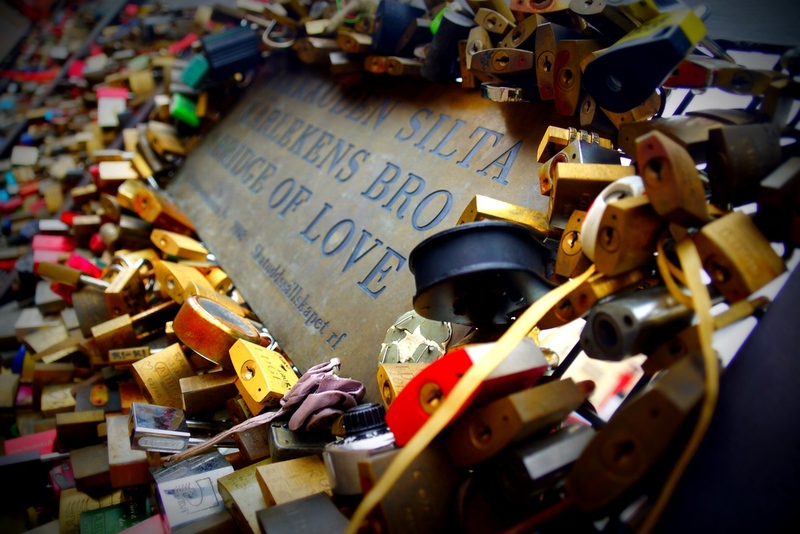 A cluster of elaborate love locks in downtown Helsinki, Finland. 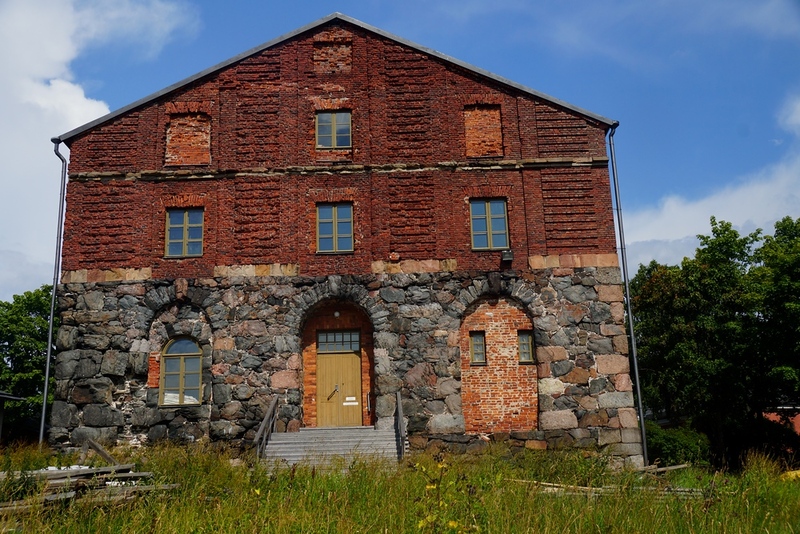 A rustic stone and brick building near the outer edges of Suomenlinna. 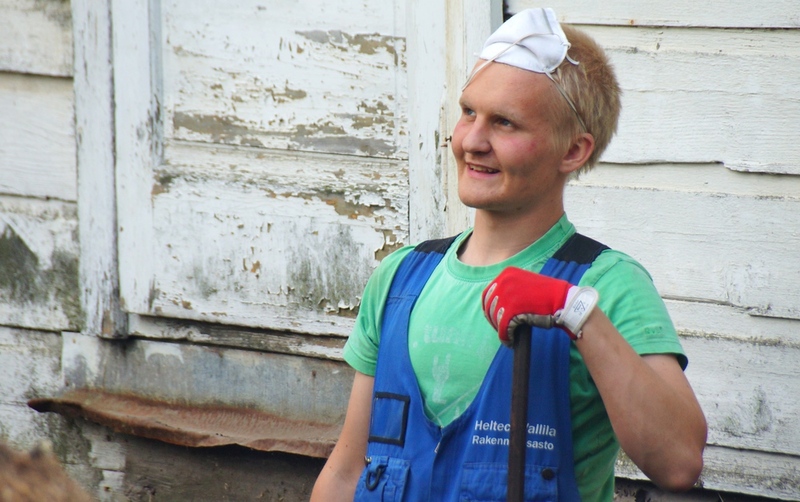 A Finnish farmer taking a break while beaming a radiant smile on Suomenlinna Island – Helsinki, Finland. Ladies sharing a laugh and smiles after getting off of the ferry from Helsinki to Suomenlinna. 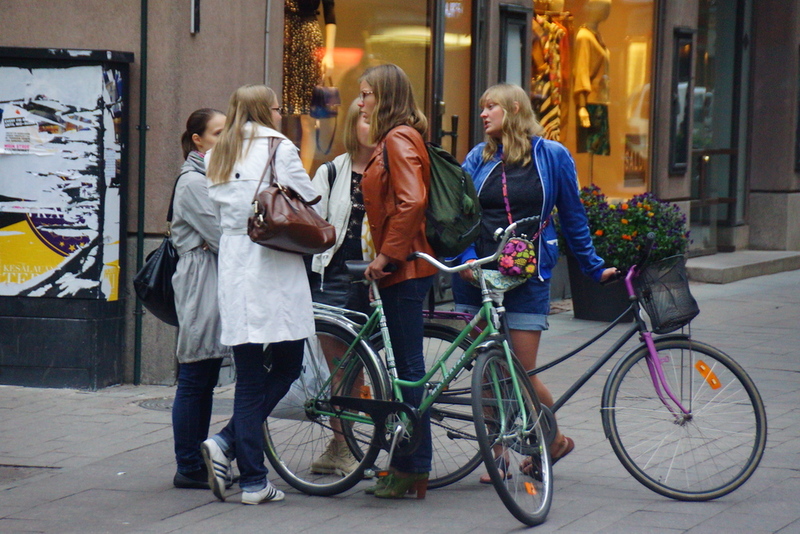 A group of girl friends dressed up nicely meeting up in downtown Helsinki, Finland. A couple stop for a quick break while biking around Helsinki. 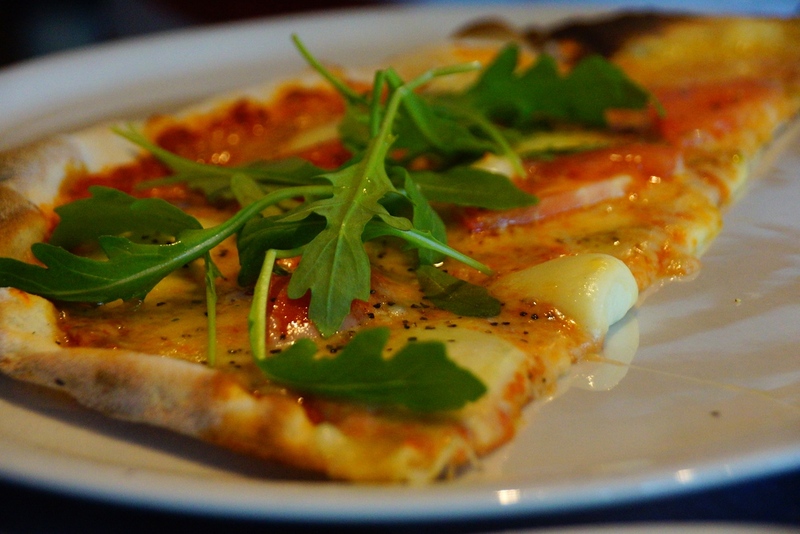 Delicious freshly made thin crust Finnish pizza. 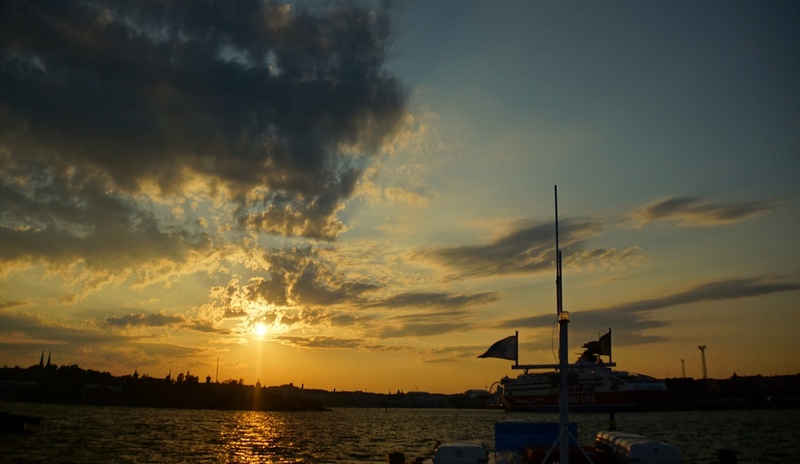 Sunset views from our ferry cruise ride heading back from Lonna Island to Helsinki. Tommi Toija’s sculpture called Bad Bad Boy, which is part of an exhibition called Mutatis Mutandis. It will be in place until October 27, 2014. Helsinki architecture just prior to sunset. 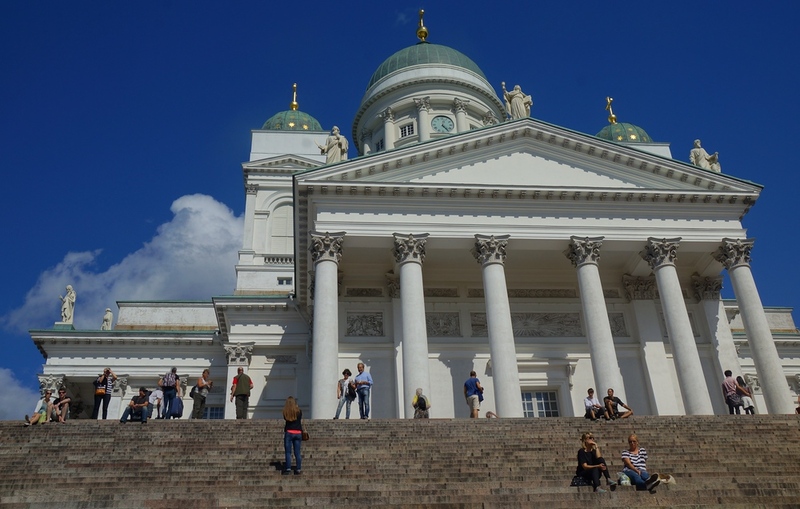 People standing on the steps and admiring the views of the city from Helsinki, Cathedral. 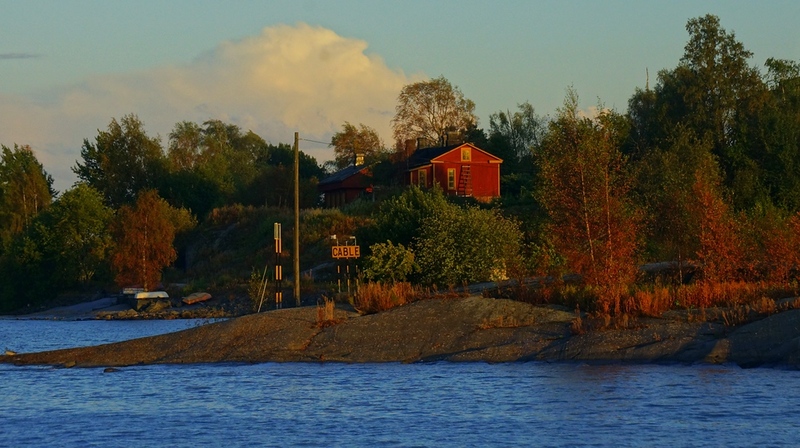 A shot of a small island just off of Helsinki during golden hour. A perspective shot of an enormous cruise liner docked in Helsinki on a gorgeous summer afternoon in Finland. A talented Finnish female performer singing on stage at Esplanade Park in downtown Helsinki. Helsinki is a city that comes alive during the summer months; it was great enjoying all the events taking place as well as relaxing outdoors. We loved revisiting Helsinki and we discovered so many new places that we had completely skipped over the first time around. I am from India, will be at Aalto University in Summers. We primarily went to Helsinki for the Tove Jansson / Moomin events, it was a really pleasant clean city. 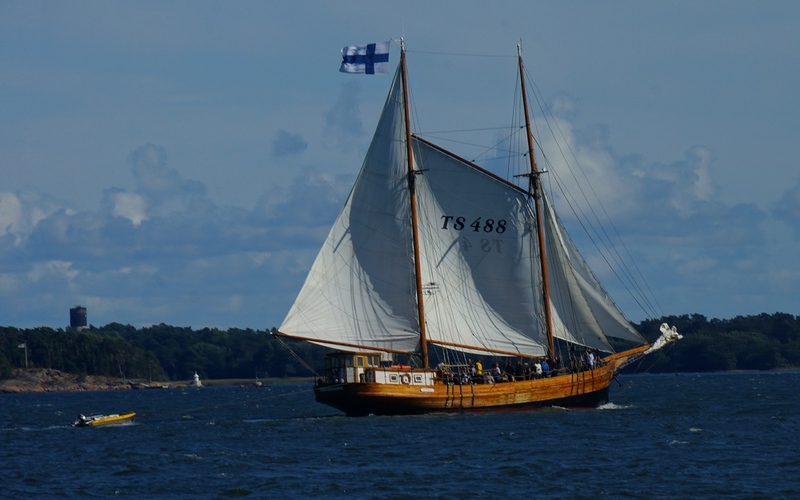 However the many islands close by were probably our highlights, e.g Kimito and Suomenlinna. Taking a Finnish sauna was a great experience too. Suddenly love this country. You have great taste of spots to take shots. I Just to say this picture is very.. very beautiful .. 🙂 I like Helsinki.. thanks for sharing. I think it’s about time I visit Finland. After all, I’ve been dating a Finnish girl for almost three years now. About time! 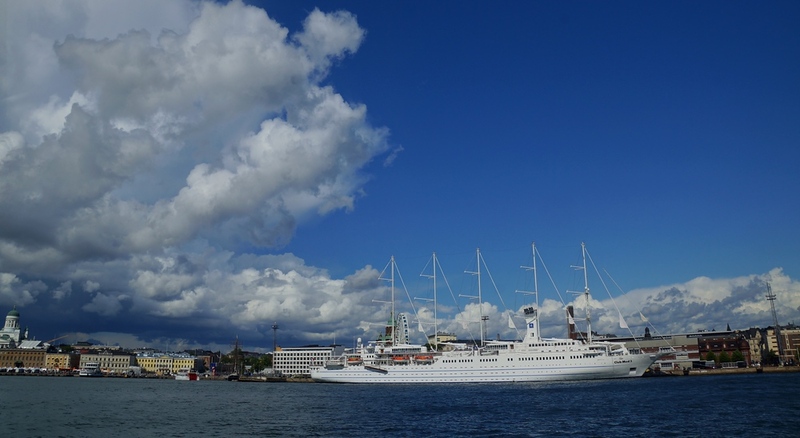 I liked most of the things to do in Helsinki in this list… your video and the photos explain how much you enjoyed your time in Helsinki… among all I think I would like to experience Chapel of Silence and Dinner in the Sky …. Some amazing architecture, and nice shots of the people. A great read. I feel it is the kind of city where you can discover new things every time you visit. The downtown core is small but once you start exploring more the city really has a lot to offer. I’m a little late to discover this post, but I’m glad I did. I’m visiting Helsinki as a cruise port this June and your video and photos have sparked my excitement. I added it to my Pinterest board for Northern European Cruise Ports. That’s awesome Laura! You picked a great month to visit. You had me at street performers and sealed the deal with the picture of that pizza…My travels haven’t taken me to Helsinki yet, but it’s definitely on the list now! Thanks for the photo tour! Gorgeous photos! Helsinki looks like a happy, vibrant place! Helsinki is also a great place to eat. But the city is terribly expensive! 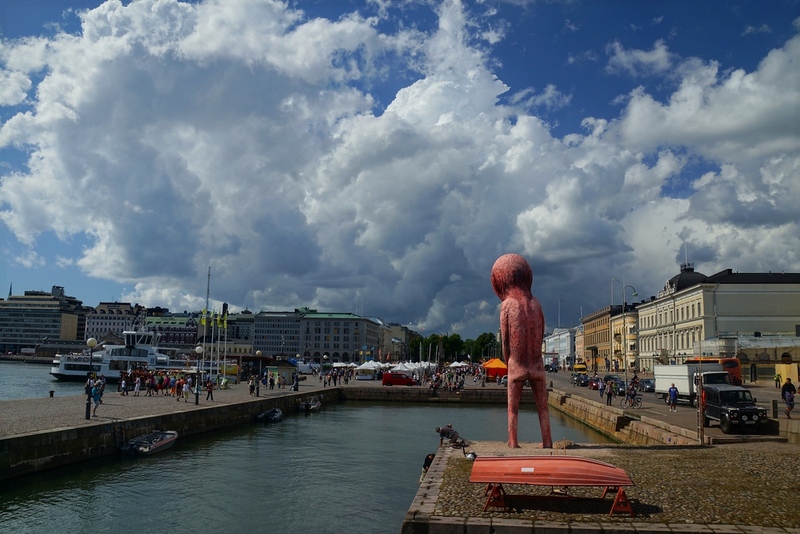 I confess Helsinki hasn’t been on my top priority travel list, but these photos look really cool. Love the chapel of silence! Visit the Finnish archipelago in a traditionally Finnish cottage! Thanks Ed! Helsinki is a really cool city to visit. Back in Canada now for a bit. Have a great time in Spain. Amazing Amazing photos i must say, Thanks for sharing! Nice article and great pictures. Had no idea Helsinki looked so nice. Thanks Tikva! It sure is a nice city to visit in the summer and I’m wondering what it must be like in the winter! I’d love to visit Helsinki, I think I’d really like it, specially because of the street performances. The carpet washing docks sound strange but interesting. Helsinki and Finland is a place I have never been. But after reading this, it is definitely on my places to visit! Love the photos too. Love this list with a little bit of everything! Your photos are amazing too! Thanks for sharing! Looks amazing – particularly the street performers (in my experience, live music gives a +++ to the atmosphere and vibe of any city). Where did you guys stay – are there good backpacking hostels in Helsinki? Thanks Nikki! The street performers were really charismatic and talented. Great article and we loved the video. We certainly need to add Helskinki to our bucket list as we have heard a lot of great things (and this further confirms it) about the place. Beautiful photos, I have always wanted to go see Helsinki and this post has just given me more reasons to go to Finland. 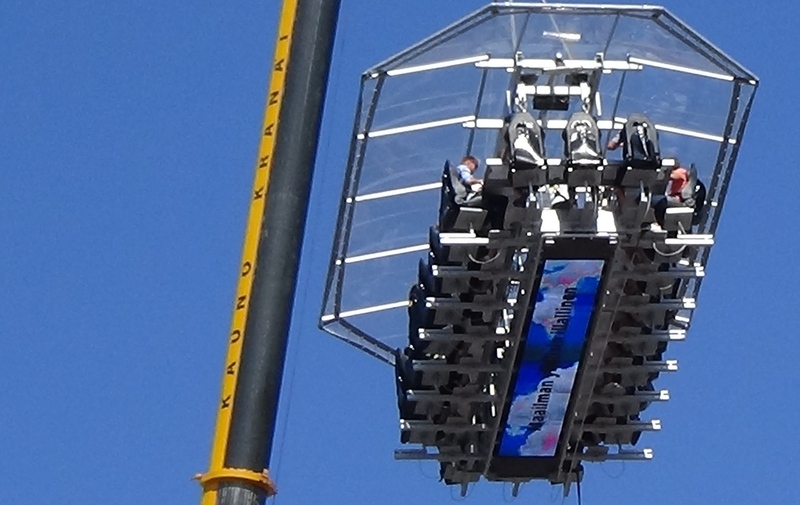 I think I would really enjoy eating a dinner in the sky, that sounds amazing. Thanks! Yeah, I wish we had the time to actually try it as opposed to just filming that special dinner. Fantastic photo essay Samuel. Its a dream to visit Finland plus other Scandinavian countries. I want to see their beautiful architecture, witness the Northern Lights and experience what it feels like to be in countries rated as the ‘Happiest Countries’ in the world. Thanks Pavan! I hear what you’re saying. I’ve yet to visit the northern part of the country and that is a high priority for me next time. Just spent a great day in Helsinki. This will make me plan a longer trip in the future and who knows maybe explore more of Finland. Helsinki is a wonderful place that needs at least one visit in a lifetime. Great video and great read. Love the pics. Loved Helsinki when we were there in the summer too! Unfortunately I missed the carpet washing docks, but the market, the churches and lovely Suomenlinna were all worthwhile! Not to mention the Salmiakki kiosk! Pingback: Heading back to Finland for more travel!